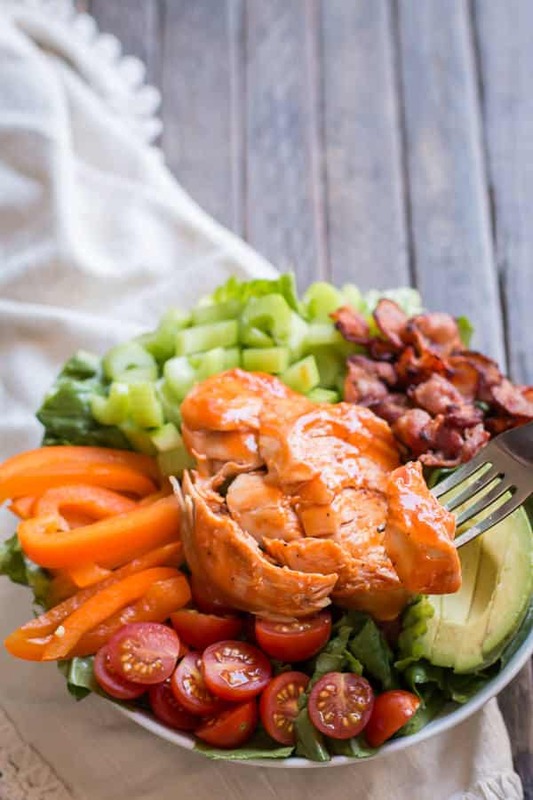 Slow Cooker Honey Buffalo Turkey Breast is sweet and spicy and perfect for topping a summer salad. Hi again! Summer is upon us here in Oregon. We had a few 90 degree days last week. I didn’t turn on my oven all week. I made this beautiful salad which had leftovers for the next day’s lunch. I eat a salad almost everyday for lunch. It was nice to use my crock pot for my salad meat, I have been getting so tired of chopped lunch meat on my salads. I start with a bone-in, skin-on turkey breast. Then I make a mixture of buffalo sauce, butter and honey. I pour half of the sauce over the turkey breast, and save the rest to glaze the turkey with when I make my salad. 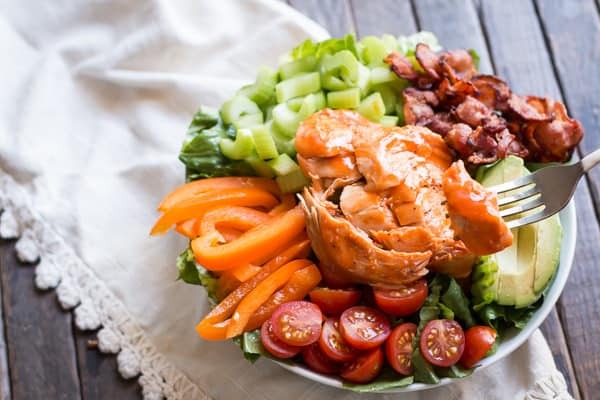 For my salad I used: romaine lettuce, bell pepper, celery, bacon, avocado, cherry tomatoes, and topped everything with blue cheese dressing. Best salad ever. The spicy turkey, crunchy bacon, and creamy avocado all come together perfectly! Other uses for this turkey could be on slider buns, or stuffed in a sweet potato, the possibilities are endless. I hope you enjoy this recipe! I will be slow cooking in my travel trailer at the coast this month. Do you slow cook while camping? 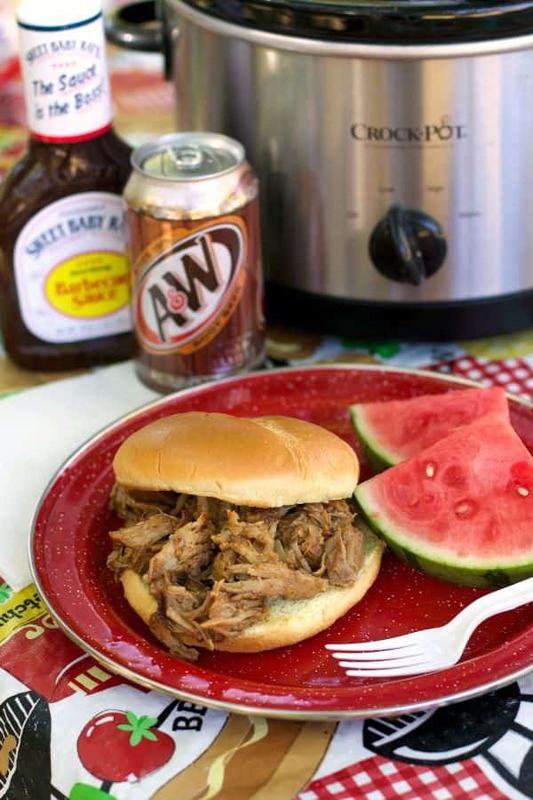 I would love to hear your favorite slow cooker recipe for camping, please leave me a comment below. 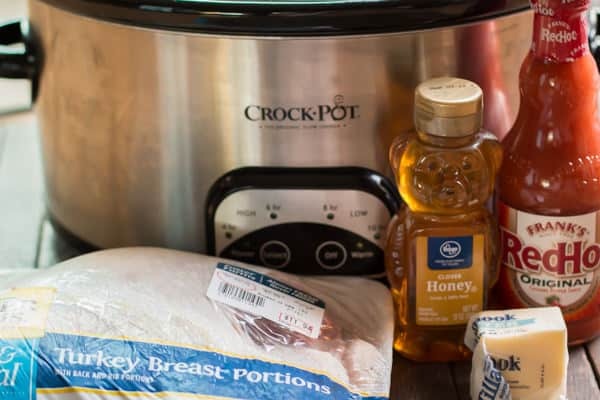 Place the turkey breast into the slow cooker. In a small bowl add the Frank's red hot, honey, pepper and melted butter, stir until smooth. Pour HALF of this sauce over the turkey breast in the slow cooker. Save the remaining sauce in the fridge. Heat the remaining sauce in the slow cooker in the microwave until warmed. 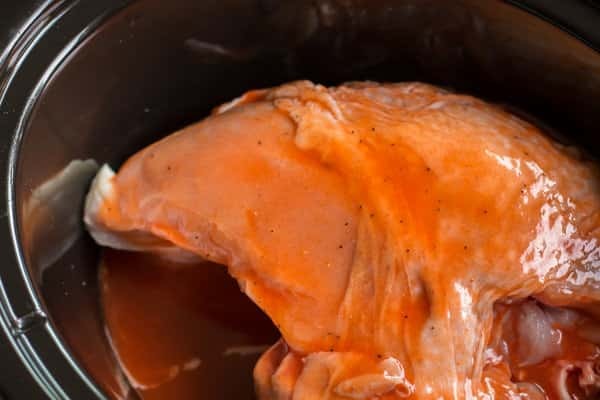 Remove the turkey breast from the slow cooker and remove skin and bone. Slice and serve with the warmed sauce. I LOVE slow cooking turkey. My husband HATES Thanksgiving turkey because it’s so dry, but he loves when I slow cook turkey breast or thighs. It’s just so juicy! Your recipe sounds fantastic. What is the butter for – and/or where does it go? Hi Patrica. The butter goes into the sauce. It helps mellow out the buffalo sauce. Could I substitute 3lb bone in chicken for turkey?